The battle cruiser HMAS Australia, the flagship of the Australian fleet, joined the British Grand Fleet in early 1915 and spent the rest of the war in the North Sea. Under the cover of the Grand Fleet, the Allied blockade prevented Germany receiving much needed supplies for its war effort. It also protected reinforcements and supplies being sent to France. Australia became the flagship of the 2nd Battle Cruiser Squadron which included Indefatigable and New Zealand. Operations in the North Sea included attempts by the Grand Fleet to bring the German High Seas Fleet to action or to cover operations by British light forces. However, Australia was to miss the Battle of Jutland in May 1916 since she was under repair at the time. Although her crew were disappointed that Australia was not at Jutland, the battle revealed serious deficiencies in British battle cruiser design with three British battle cruisers including the Indefatigable lost with few survivors. In October 1916, the Australian light cruisers, Sydney and Melbourne also joined the Grand Fleet. They were used to screen the battle cruisers of the 2nd Light Cruiser Squadron and were often escorting convoys to Scandinavia. On 4 May 1917, Sydney, HMS Dublin and four destroyers engaged in a spirited but inconclusive action with the German Zeppelin L43. 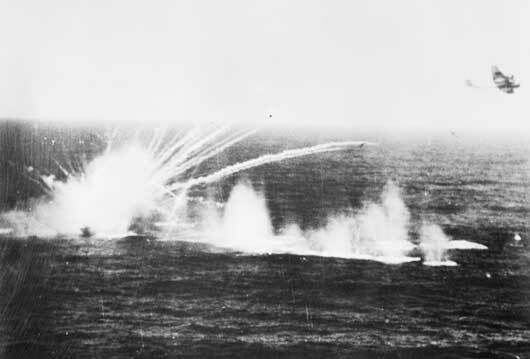 The Australian ships participated in early experiments in naval aviation which proved the feasibility of operating aircraft from flying off platforms fitted to battle cruisers and light cruisers. Eleven officers and men of the RAN took part in the Zeebrugge raid on 23 April 1918 with Commissioned Engineer William Edgar being awarded the Distinguished Service Cross, the first such award to the RAN and the only one awarded to the RAN in the First World War. Allied naval and air force operations in the North Sea during the Second World War were largely an extension of the Battle of the Atlantic, which lasted for the entire duration of the war, and represented the constant struggle to keep British supply lines clear from the threat posed by German warships and submarines. Although no Australian warships operated in the North Sea in the Second World War, the RAN was well represented with many officers and men serving of Royal Navy ships in the area. RAAF Beaufighter crews flew a number of missions in the North Sea and the fjords around Norway against German shipping. 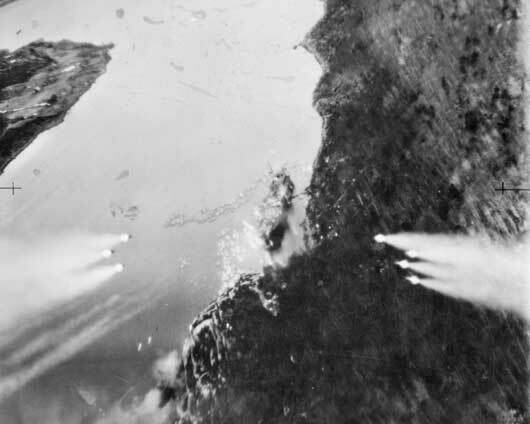 Enemy shipping under attack from Beaufighter aircraft of 455 Squadron RAAF in Stav Fjord, Norway (AWM 138202). 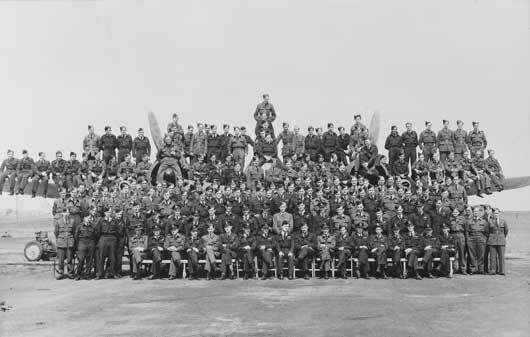 A group portrait of all members of 455 Squadron RAAF, assembled on and in front of one of the squadron's Bristol Beaufighter aircraft (AWM P01704.001). 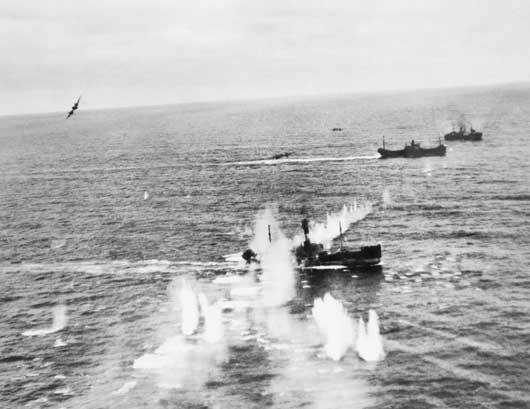 The view from the cockpit of Flying Officer Neil Reginald Smith's 455 Squadron Beaufighter, as he launches a salvo of rockets at a German merchant ship anchored in Orsta Fjord (AWM P05831.002). 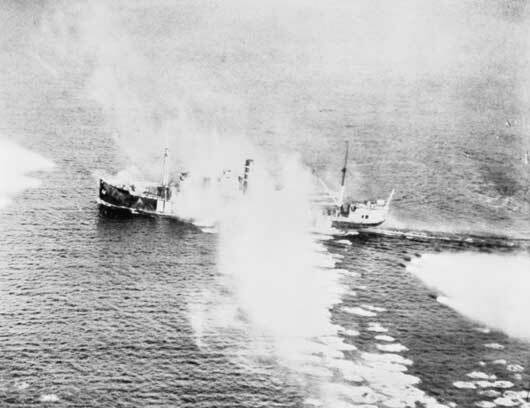 An armed trawler explodes in the North Sea, following attacks by cannon fire from aircraft of 455 Squadron RAAF (AWM SUK12168). Beaufighter aircraft of 455 Squadron attacking a convoy of German shipping off the Frisian Islands (AWM SUK12224). 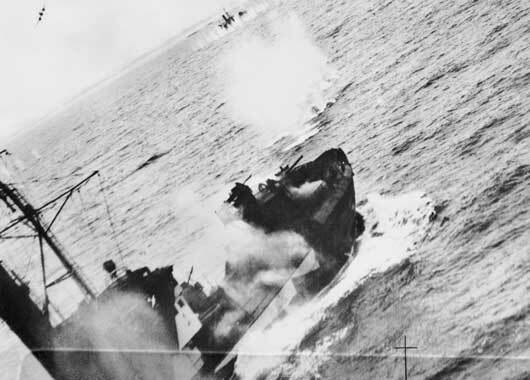 Armed trawlers in an enemy convoy being attacked by Beaufighters of RAF Coastal Command, which included aircraft of 455 Squadron RAAF (AWM SUK12403). 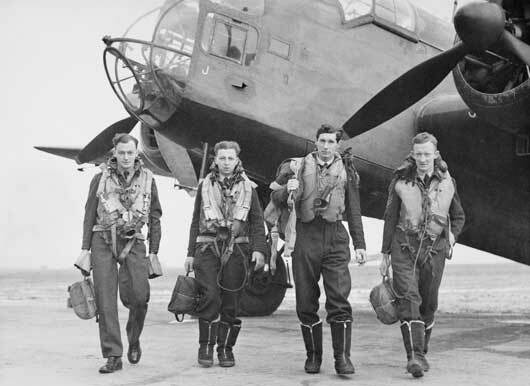 At a Coastal Command airfield in Scotland, the crew of "H" for Harry of 455 Squadron RAAF leave their Hampden torpedo bomber after completing a test flight (AWM UK0170).